What is white wine vinegar? About the ingredient white wine vinegar. Including 493 recipes with white wine vinegar, nutrition data, and where to find it. White wine vinegar is made from white wine and is the most commonly used vinegar in Mediterranean countries and Central Europe. As with wine, there is a considerable range in quality. Better quality wine vinegars are matured in wood for up to two years and exhibit a complex, mellow flavor. Wine vinegar tends to have a lower acidity than that of white or cider vinegars. More detail Order now to save $0.15! 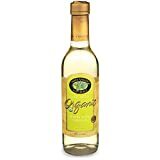 White wine vinegar is usually found in the oils section or aisle of the grocery store or supermarket. 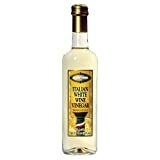 White wine vinegar is a member of the Spices and Herbs USDA nutritional food group. How much does white wine vinegar weigh? There are 497 recipes that contain this ingredient.